A correspondent recently asked if it was possible to successfully day trade stocks without doing much research. The question was poorly worded, because it depends entirely on how we define much. But before I answer the actual question, I wanted to address the rather worrying subtext within it. It’s all standard stuff here —a regular entry and an exit when it faltered at the intitial target. Then it made another move on even greater volume, so there was no reason not to take the second short. Again, the exit was when it faltered, thus taking the easy middle bit. 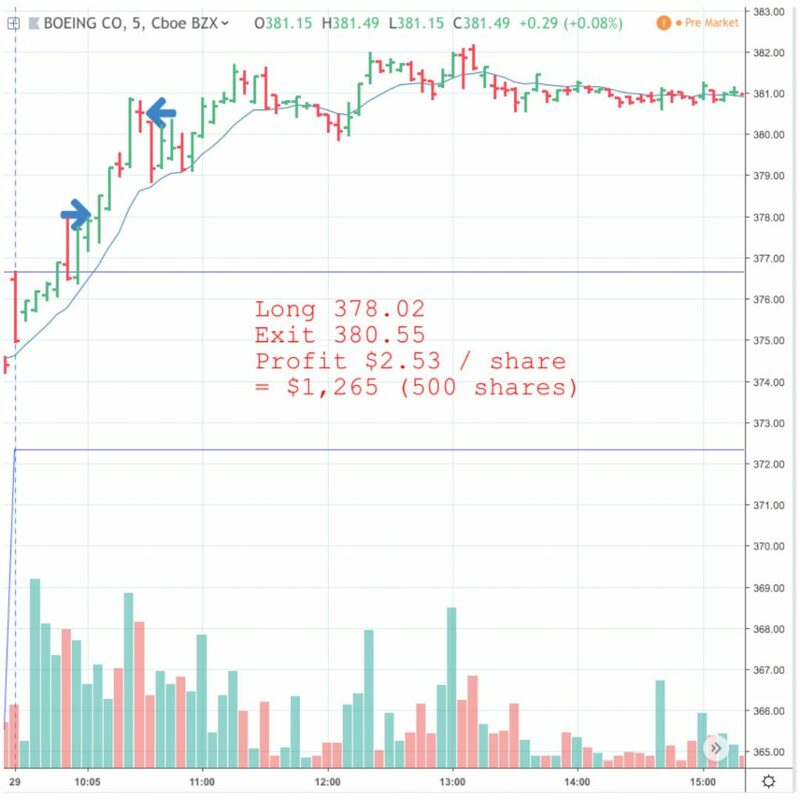 The two trades combined to produce $860 profit, all in under half an hour. Not to be sneezed at. I should mention that I have guests staying for the next couple of weeks, so I will be trading infrequently (if at all) and posting even less frequently! It’s good to take a break once in a while. It all started out so well. The setup was good and it looked like there was some momentum, but the price hesitated. My rule is if it doesn’t go well right away, get out. There’s no point hanging around to see if it will come good, because most of the time it won’t. I jumped ship with a single cent profit, which covered half the commission. In this case the trade did eventually come good, and I went back in just a cent higher than I’d previously got out. 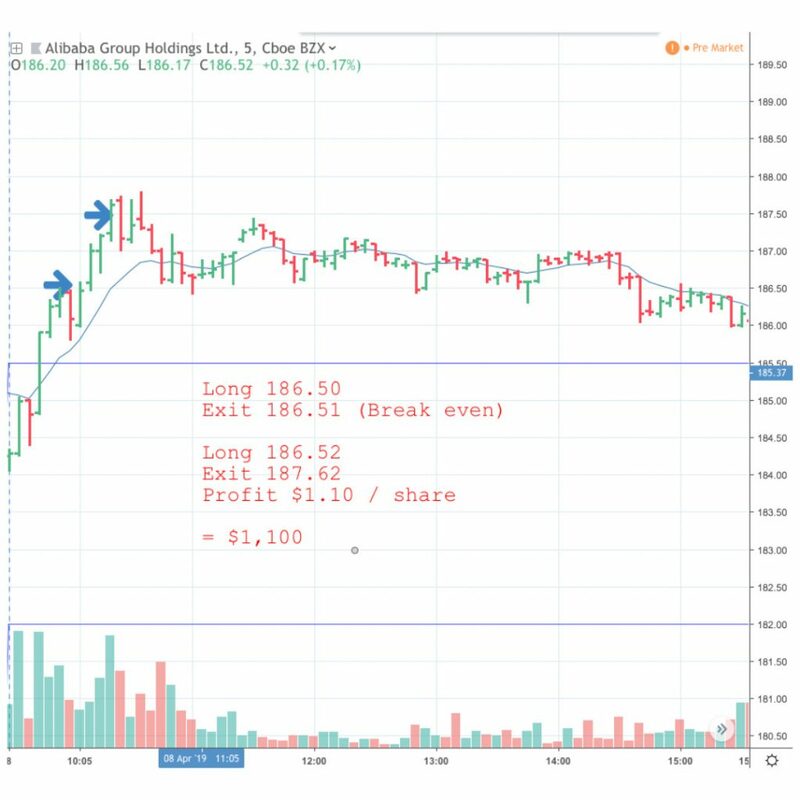 This time there was no hanging around, momentum was there, and I rode it up for more than a dollar, thus taking more than a thousand dollars profit on BABA. People quite often tell me they get killed in the market by being stopped out all the time. And almost equally as often they tell me that the trade they were stopped out of then turned around and became a winner, except they were no longer on board, adding insult to injury. They ask me if they are choosing bad stocks. The thing is, you can’t really choose a bad stock as such, just a bad entry. Sure, if you pick the ‘right’ stocks you will find a higher rate of good entries coming your way, but even a poorly chosen stock can present a good entry. Just as a theoretically excellent stock can offer a bad one. The problem these traders have is that they are waiting for their stop loss order to be hit. 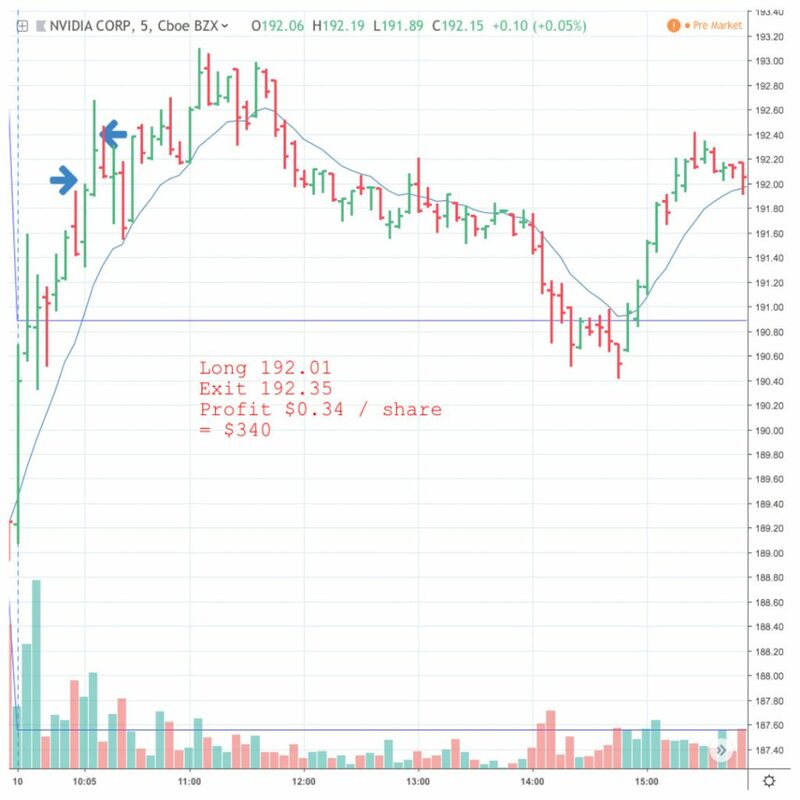 Stop loss orders are an essential tool for the day trader, and wherever possible I recommend having a stop automatically placed by our trading software as soon as our entry order is filled. But the job of that stop order is to be our emergency exit. It’s like an airbag in a car — a last line of defence if we lose control. If we are driving at high speed and see a collision ahead, we wouldn’t keep our foot on the gas and assume the airbag will save us, we would at least try and brake to stop the car before we hit the obstacle. The airbag is only there in case the brake doesn’t work, or if we cannot stop in time. The stop loss order is the day trader’s airbag. It’s there to take us out of a trade if we lose our internet connection, or if our computer crashes before we end the trade, or if there’s some other kind of problem that means we are no longer in control. But as long as we are in control, we don’t want to rely on that stop order. If a trade doesn’t work out the way we envisage, there is no point waiting for the stop to get hit. We should always try to exit ourselves, and do so quickly with the minimum possible loss. In the above trade, I was out with a 1 cent profit. 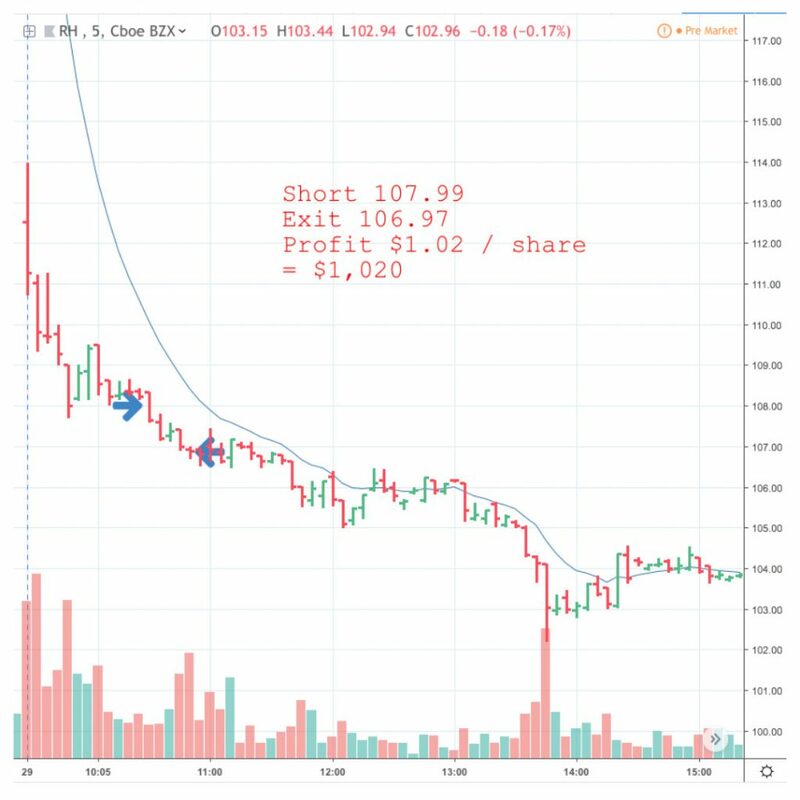 That’s $10 on 1000 shares, so in reality a $10 loss once commission is taken into account. 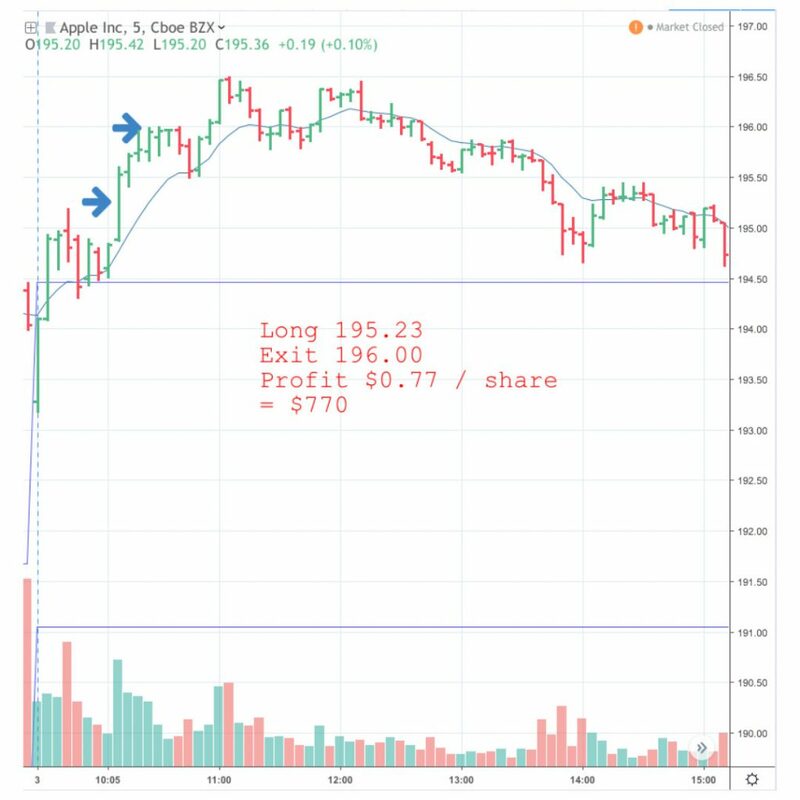 Had I waited for my stop loss order to be hit, I’d be looking at a $50 loss at least, which would be $70 after commissions. I could take a $10 loss on every core stock on my watchlist and still be better off than taking a single $70 loss! What’s more, I only need to make a tiny profit on one trade to easily cover my tiny loss. But if I rely on my stop and accept the bigger loss, I’m on the back foot with a defecit to try to recoup. Having taken that tiny loss on BABA, the tape showed renewed momentum and the price made another break for it. There was no reason not to enter again, so in I went. Had I been burned by a larger intial loss, I might have hesitated on taking the second entry. But having got out quickly for essentially break-even, there was no reason to hold back. 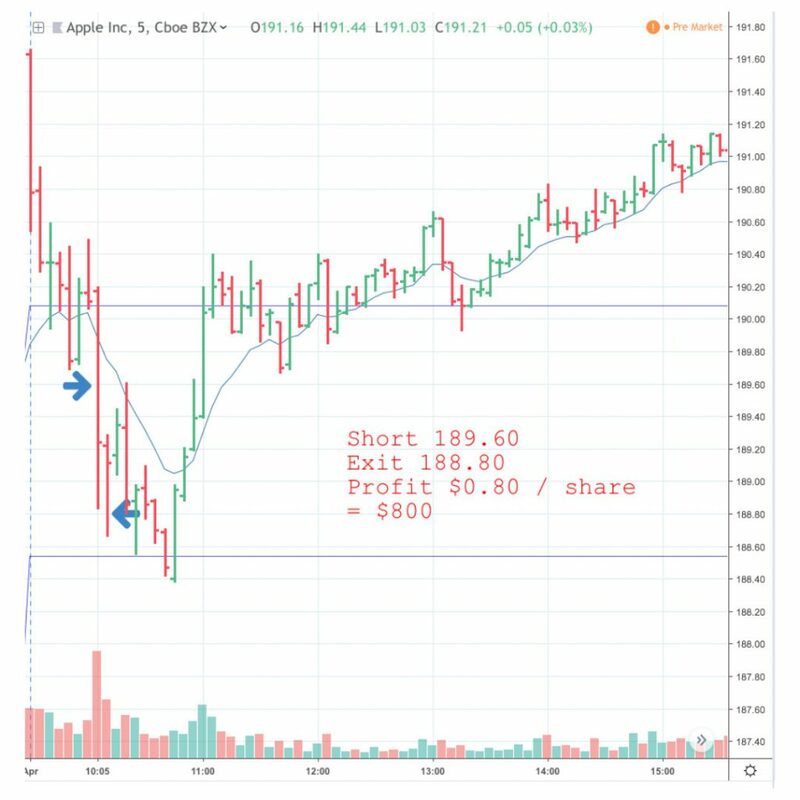 Keeping losses small by exiting at the first sign of trouble means that we get to keep our account balance intact, it takes the pressure off trying to win back a large loss, and it means we can take multiple entries without hesitation or fear of the risk. Stop orders are for emergencies only. 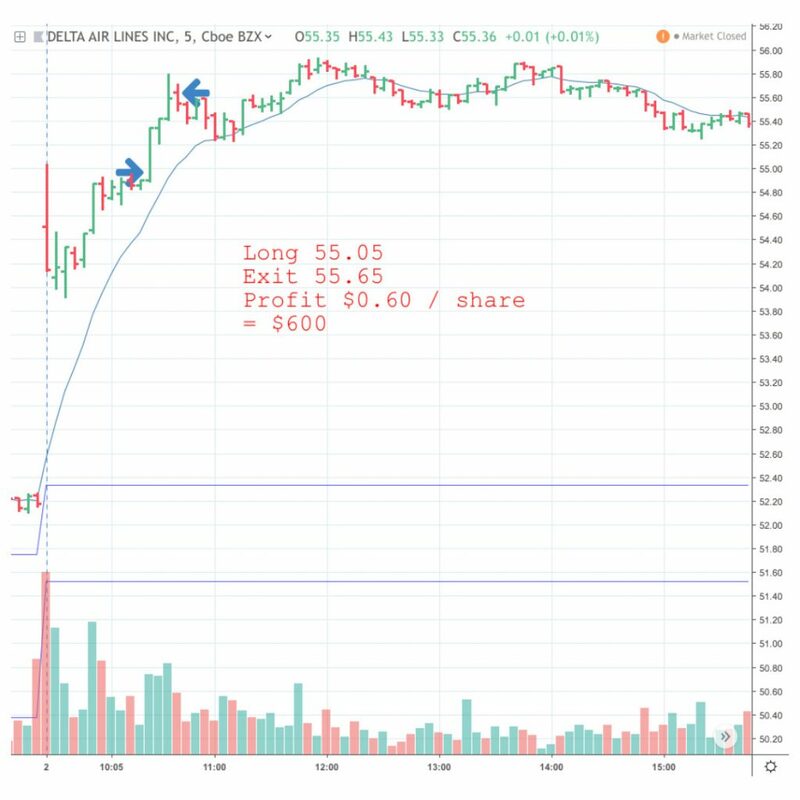 First entry was textbook, with an exit at the initial profit target to take $400. But there was another clearly signalled move (complete with triangle confirmation) on even bigger momentum, so it was worth jumping aboard to ride it down further. Thad added another $370 to the pot in about ten minutes or so. So a total of $770 for this stock. 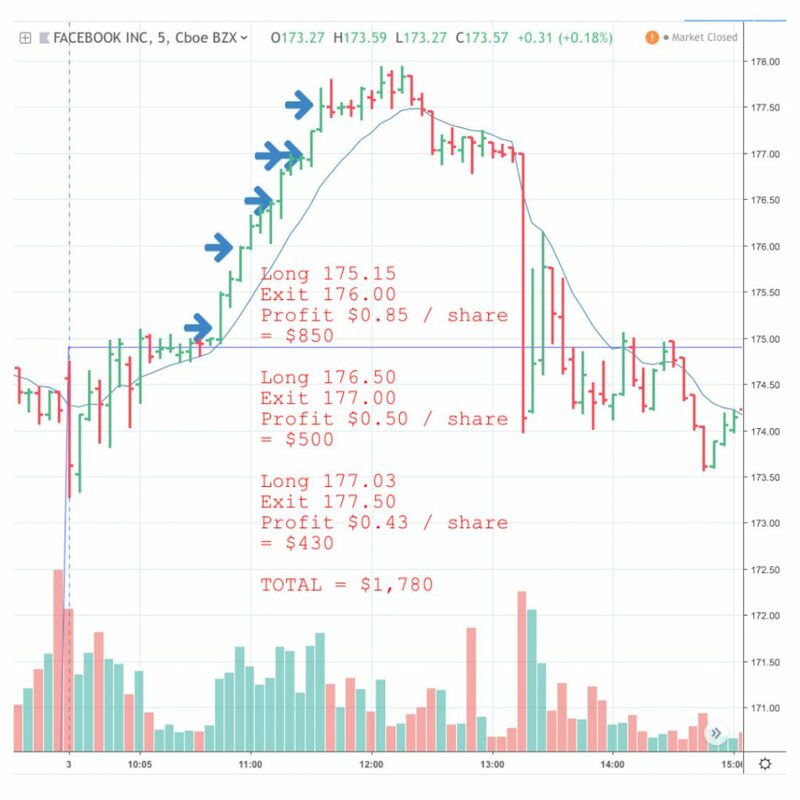 There was more to be had for anyone trading a different strategdy and who doesn’t mind taking trades going into the lunchtime slump. As a reminder, I don’t post all my trades here (it would take too long and I’m lazy), just a selection that I think are interesting or that give a flavour for any given day. Although there was plenty (plenty!) more to come after the initial textbook entry, the signals weren’t as strong and momentum wasn’t so much in evidence. You win some, you lose some, and you miss some. Still, almost $800 banked for a fifteen minute trade isn’t too shabby. As we can see, this was a three biter. 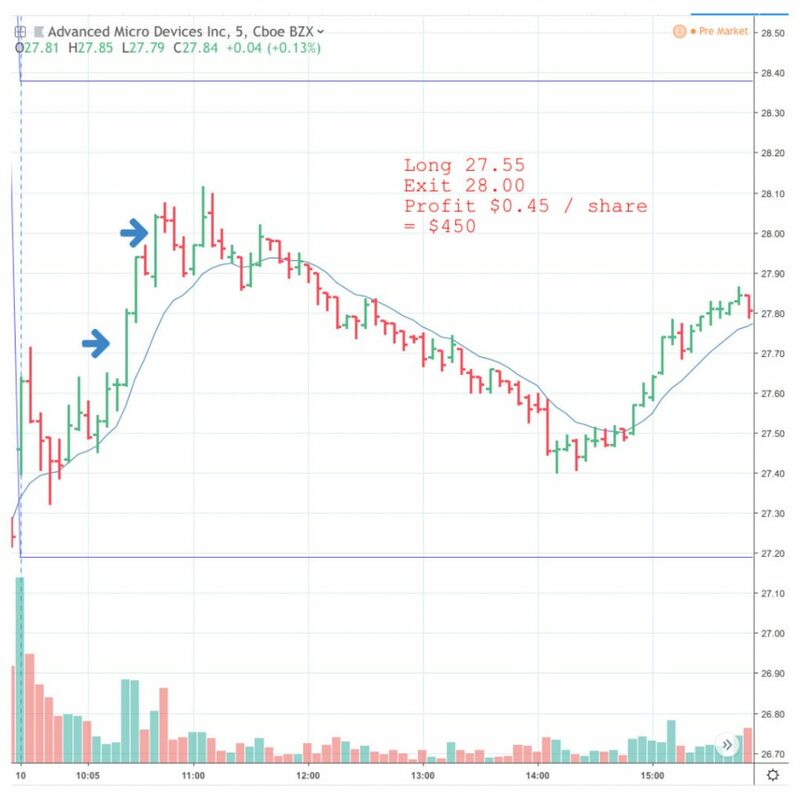 The first entry was a no-brainer — a textbook setup with the added advantage of a nice triangle pattern to add weight to it, good volume and momentum, and a realistic target with great profit potential. The target was easiy hit within fifteen minutes, netting $850. I would have left it there and been happy with the result, but the price kept going and showed every sign of having more to give. So when a second entry came along, it was well worth taking. 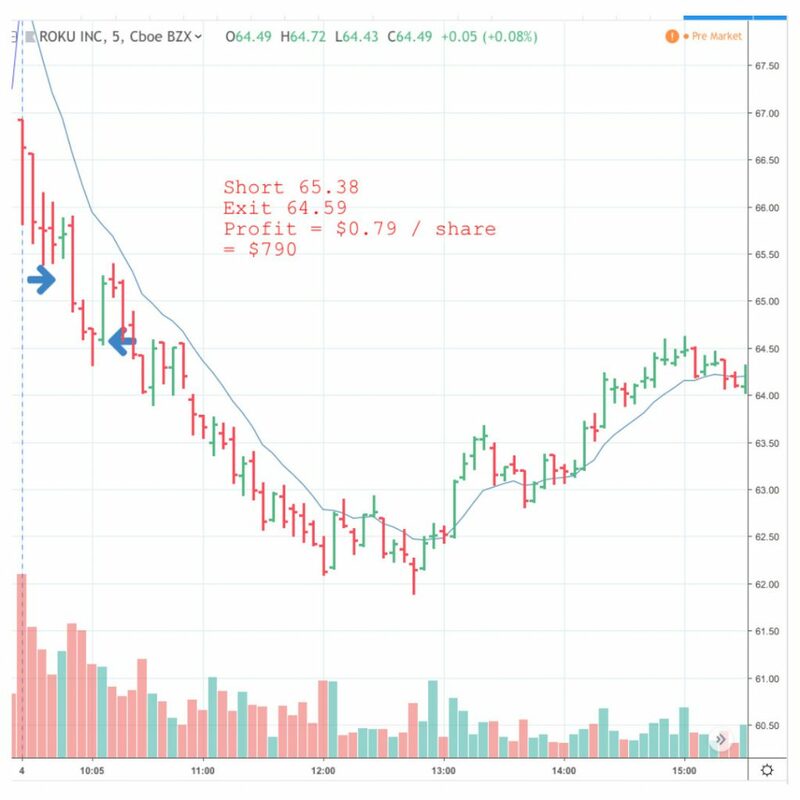 With my finger hovering over the exit button ready to give back no more than $50 of that first profit if I was wrong, I watced it make me another $500 in ten minutes. 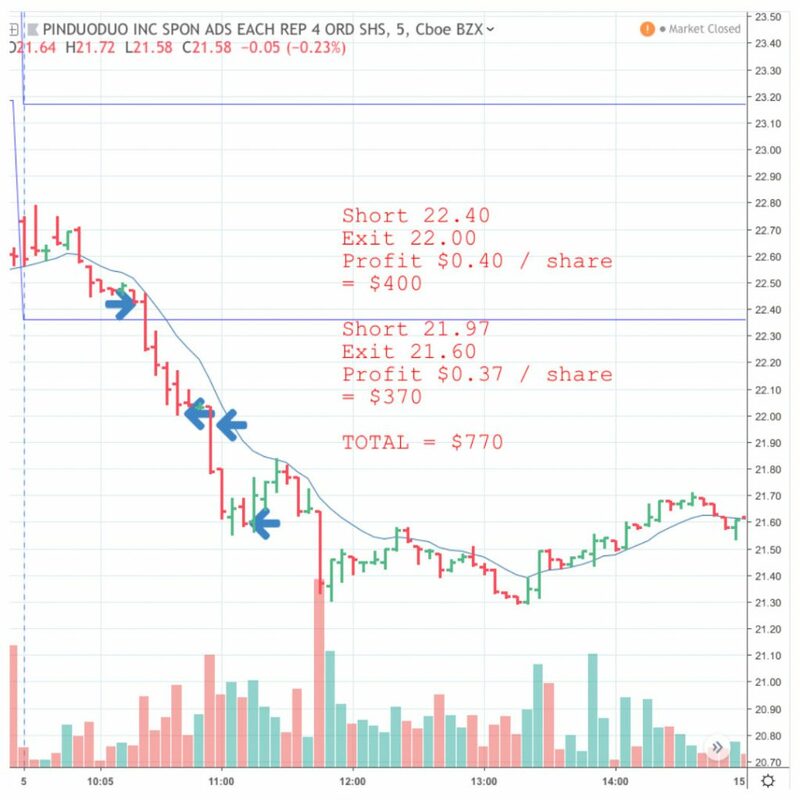 After bumping up against the second target price for a while, it made another break for it, and I was happy to go along for the ride, taking profit at the obvious target. Finally momentum faded, the price started going sideways, and more importantly, it was lunchtime, so that was me done for the day. $1,780 banked. A nice morning’s work. As is so often the case with Apple, the trade was fast and furious. $770 profit (exiting at the target) in about fifteen minutes. Just as well, as it left the account funds available for the FB trades! You have to love it when a setup combines with a pattern like a triangle. Extra confirmation is always a bonus and gives you more confidence to go into the trade. Naturally we always want more than one signal anyway (usuaully the chart setup and the tape), but seeing extra confirmation on the chart is nice to have. In this case it meant being able to take the entry a little earlier than normal, adding a few cents to the bottom line. A few cents might not sound like much, but when your finger is hovering over the exit button ready to hit it if the thing goes just a few cents against you, it can be the difference between the trade working out or not. Obviously this one did work out, making $600 in about fifteen minutes. The exit was when momentum evaporated and the price started heading south. 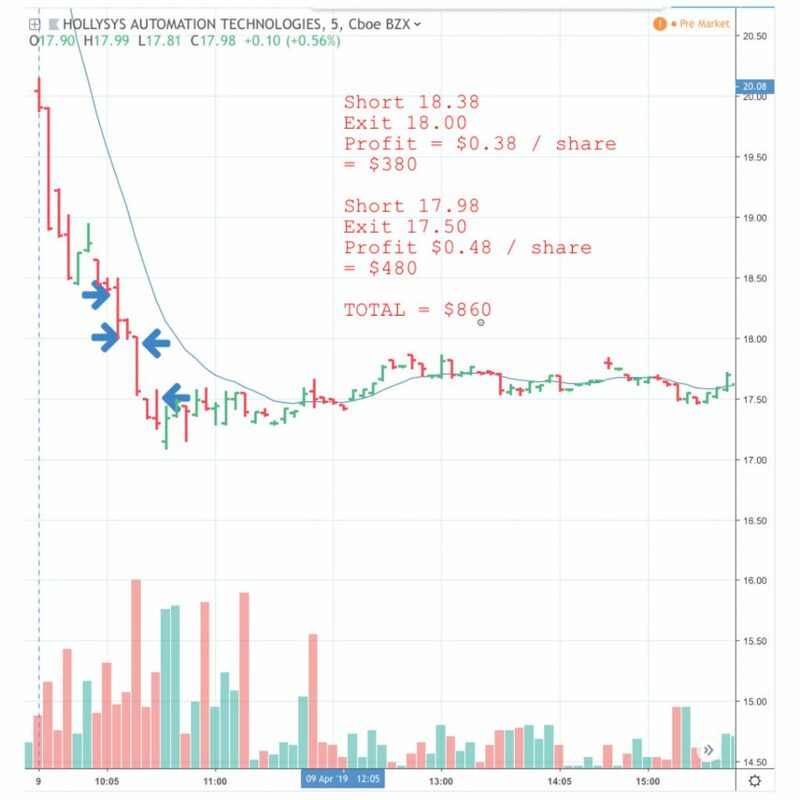 It’s standard stuff from this core stock — a textbook entry then an exit when the momentum dried up and the price failed to reach the initial target. The trade lasted about six minutes, so that’s more than $100/minute profit if you like counting that stat. It’s a useless statistic of course, because it doesn’t count the pre-market homework and the waiting around for a trade to present itself. Even so, for a total of about three hour’s ‘work’, $800 isn’t bad, and that was just one of the day’s trades. With such a high-priced stock, I’m trading smaller than usual size. Even so, the range of BA means that $1,265 profit from a twenty minute trade is quite doable. There’s nothing hard about these trades; they are bog-standard setups of the kind I’ve been trading for decades. Someone asked me the other day if my trading strategy only works in a trending market, which misses the point entirely. These are momemtum setups, and the point is that in a vast universe of stocks, there are always momentum trades to be had. What the overall market is doing is largely irrelevant. It could be the flatest or choppiest day you like, there will always be at least a handful of stocks that move like that BA chart above. Which is why these setups stand the test of time; they are not a short-term play that require specific market conditions. Strictly speaking this was an early entry. Howver, it was so clearly signalled it was worth the relatively tiny risk. 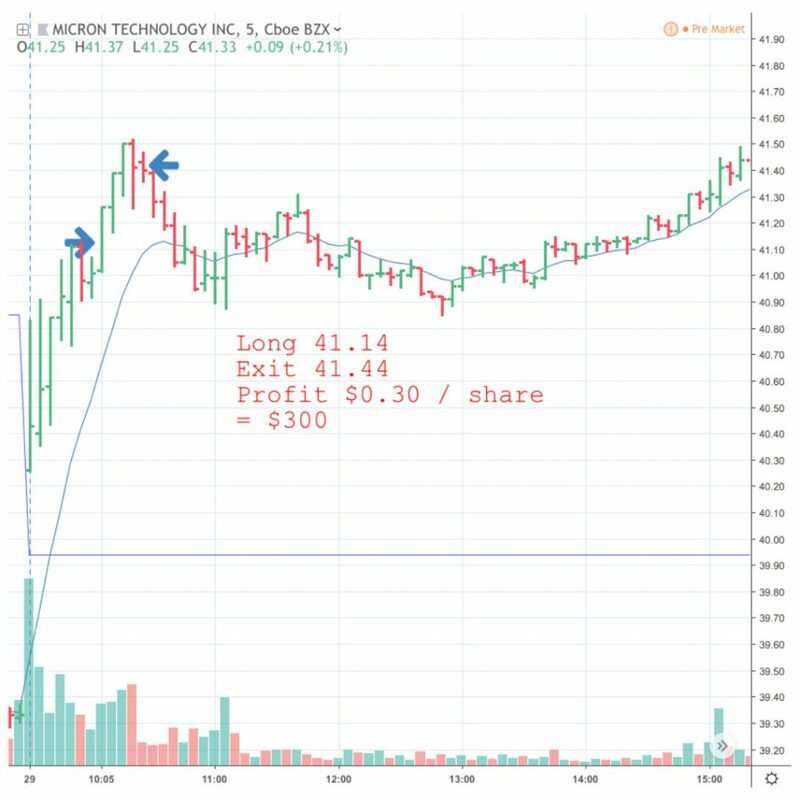 Especially given the potential upside, and indeed this was another twenty minute trade that produced a four-figure profit. Far less impressive to look at than the others, but remember trades like this are the bread and butter of the pro trader.